As per the information provided by the Bureau of Labor Statistics, in May 2013, the average CNA salary in Wyoming was $27,750 per annum and $13.34 per hour. The total number of CNAs employed in this year was 3,270 and the employment per thousand jobs was 11.72. 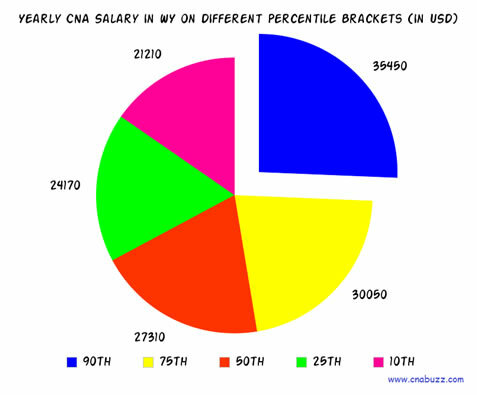 According to a survey conducted by indeed.com, it was reported that CNA salary in WY was $20,000 in January 2015, which was 17% lower than the average salary all over the country. Undoubtedly, the certified nursing assistants who are working in the same field for years will surely have better job opportunities and earn higher pay. 90% of CNAs offered less than $35,450; 10% enjoyed more than $35,450. 75% of certified nurse assistants were salaried less than $30,050; remaining 25% earned more than $30,050. 50% of the employees received less than $27,310; rest 50% earned more than $27,310. 25% of CNAs were waged less than $24,170 annually while 75% were compensated more than $24,170. 10% of employees were paid less than $21,210; 90% were offered more than $21,210. The earnings of a certified nursing assistant in Wyoming are calculated by keeping into consideration the geographical and educational factors. According to salary.com, in January, 2015, Casper and Laramie were the highest paying cities with median annual, monthly, weekly, and hourly salary $28,021, $2,335, $539 and $13 respectively. Gillette paid $21,874 yearly to its nurses with a median monthly salary of $1,823. There are several job titles in the nursing field that are given to the certified nursing assistants, on the basis of education level and specialization, which in turn decides their salary. For example, CNA Hospice made $26,000 while CNA Rrmc and Medical Assistant Family Practice earned $24,000 (as of January 2015). Correctional Prison Facility CNA is the lowest paid job title with an average salary of $12,000. CNAs play the most important role in healthcare facility. Hence, they are highly demanded professionals. They are mostly prevalent in long-term care and nursing facilities. According to the U.S. Bureau of Labor Statistics, it has been reported that the number of job opportunities for certified nursing assistants will be numerous in between 2012 and 2022, with a rise of approximately 21 percent. Although, several nurse aides leave their jobs in order to pursue advanced program course. 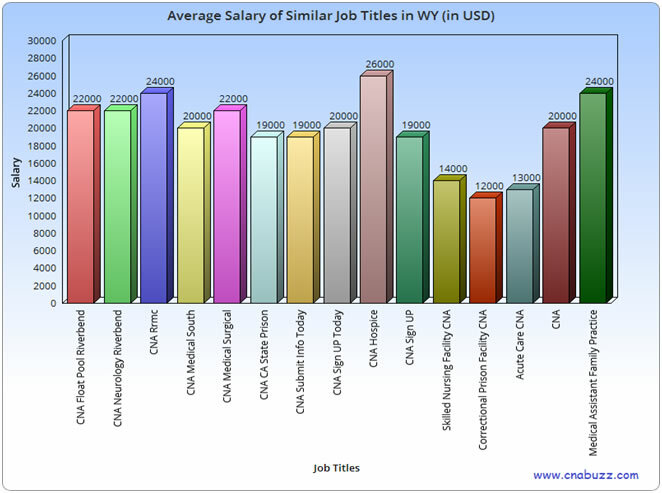 Question 1 – Can anyone help me in suggesting some of the best earning job titles in Wyoming? Answer – In Wyoming, CNA Hospice enjoy the highest income of $26,000 per annum. Other top paying job titles include Medical Assistant Family Practice ($24,000), CNA Float Pool Riverbend ($22,000), CNA Neurology Riverbend ($22,000), and CNA Rrmc ($24,000). Question 2 – At present, I am employed as a CNA in Kentucky, but planning to shift to Wyoming after 1 year. How much salary can I anticipate in the state? Answer – Certified nursing assistants willing to start their nursing career in the state of WY can expect an average pay of $20,000 per annum.